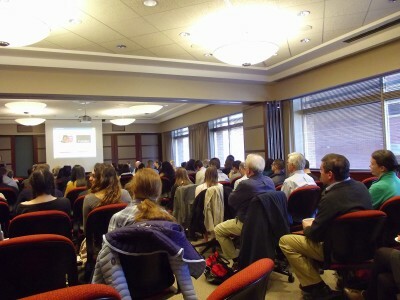 The Boston University community is encouraged to use a crowdfunding platform if they need to raise money for research or activities, panelists said in a workshop Wednesday afternoon. Campaign for BU hosted the “Crowdfunding at BU” panel at the Questrom School of Business. Approximately 65 BU community members joined five panelists to learn more about crowdfunding tips and benefits. Lauren Wake, a client solutions consultant for ScaleFunder, a digital fundraising platform, moderated the panel. Wake outlined the best ways to make a crowdfunding project attractive, and said the key to crowdfunding is community engagement. BU Crowdfunding, the university’s fundraising platform, has been successful at BU since its official launch in May 2014, Wake said. Seven crowdfunding projects were launched in the past two years, five of which were either completely funded or exceeded their original goal. Each project raised an average of $10,000, Wake said during the panel. Crowdfunding can be particular effective because the younger generation prefers to know where their donation goes, Caitlin Cushman, a BU Crowdfunding administrator, said during the panel. Christopher Gill, another panelist and a professor in BU’s Center for Global Health and Development, said he used crowdfunding to fund his research, which analyzes how to recognize people by their ears. His research idea, “Project SEARCH: Scanning Ears for Child Health” seemed crazy, he said, but crowdfunding helped make it a reality. Elizabeth Ragan, a project leader who works with Gill, said she looks for people who share her project’s mission, increasing the amount of donations. The BU Dance Team used crowdfunding for the past two years to pay for their trips to a national dance competition, said Amber Thiel and Megan Dacek, co-captains of the team. The most efficient way of spreading the word about their crowdfunding was email and social media, they said. “We send out emails and try to make those as enticing as possible, so people don’t think [our emails] are spam emails from BU about donating,” Dacek, a senior in the College of Engineering, said. Sara Mejias Gonzalez, a senior in the Frederick S. Pardee School of Global Studies who attended the panel, said that in one of her classes, they are trying to build an app to help find aid for Syrian refugees. The group is looking for funding to create the app. Kari Wu, a first-year graduate student in Questrom, said crowdfunding can be effective because it does not require too much effort from either the donors or the users. Andrew Parlato, a BU student giving coordinator, said he has met students who want to give to specific causes or groups, and crowdfunding allows for that to happen. These are really great projects. Anytime you can freely create and start a crowdfunding campaign is an advantage. Most universities and schools should be running crowdfunding websites as well. It’s a great way for faculty staff and students to engage in various projects and build awareness. Whereas before, they did not have the means to access funds or engage with people easily.